Thus ends the Cushion Foundation Week 3 – a series I never really intended to produce, but arose out of opportunity. After my last foray into cushion foundations in Week 1 and Week 2, I was quite set in my decision. Cushion compact foundations are for me a non-essential makeup item. I still prefer my liquid foundations, or BB Creams, and I stick by my preference. I was quite pleased in my journey, to have discovered the Sulwhasoo Perfecting Cushion because it quickly became a firm favourite of mine. It is still the only cushion foundation I voluntarily use. The others I have, I use them as and when I remember, but they aren’t items I reach out for. Cushion Foundation Week 3 arose not due to my desire to own more of these cushion things, but due to the enduring nature of this form of base makeup, that I predict will be around for quite a while to come. You will notice that all of them were generously provided by the respective brands, for which I am grateful. Barring Sulwhasoo, I don’t think I’d actually buy any of them. Yet, I was glad of the opportunity to try them, because I discovered the Shiseido cushions, that I would have otherwise overlooked. I was quite intrigued by the fact that the cushion foundations I’ve featured this week, are for the most part, quite high in coverage. When these things first came out, the common lament was the lack of coverage offered. 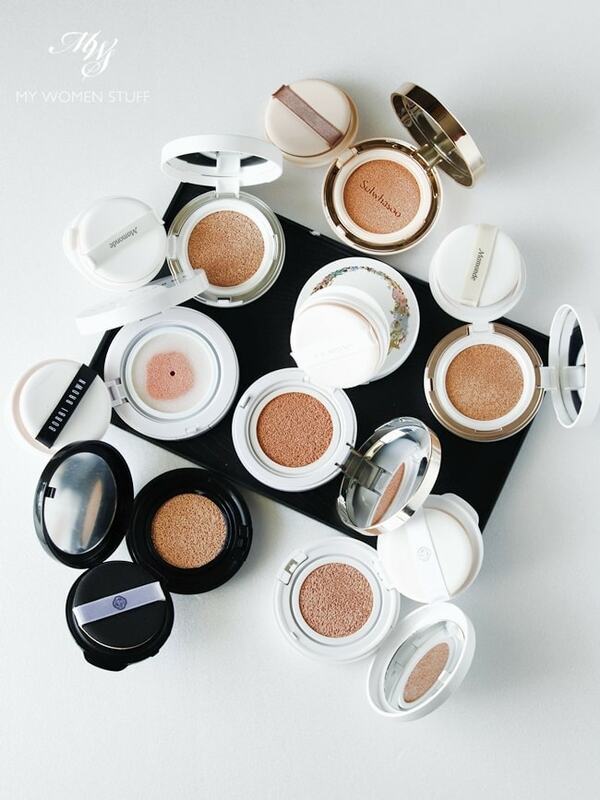 While the Koreans intended for these cushion compacts to give skin a dewy, moist, glowy appearance, barring the higher-end brands, they never quite focused on coverage. My observation of new releases from other brands not featured, bears this out (Dior, for example, quickly released 2-3 different cushions after their first, with significantly better coverage). There is definitely a shift towards a cushion foundation that is more like foundation in coverage. 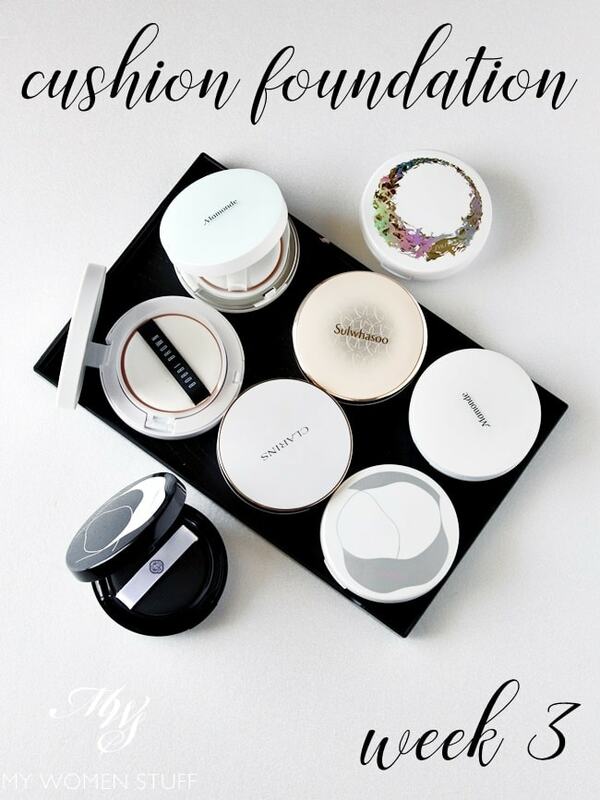 When I investigated Korean cushion foundations last round, I found that it was the more expensive brands – Hera and Sulwhasoo – that offered better coverage, texture and formula overall. It led me to believe that there is no real parallel between the affordable and the higher-end brands in the realm of cushion foundations. To get something of better quality, you had to pay for it. The same observation is holding true in this week’s comparison. The Japanese have entered the foray, with Shiseido leading the charge, and more Western makeup brands are also adopting this form of foundation, and even improvising on it. This tells me that we aren’t going to see this cushion thing go away soon, and that you still have to pay to get a good quality product. Granted, you may not agree with me, and I’m fine with that. But if the opportunity arises for you to try one of the more premium-brand cushion foundations, try it and then tell me that it doesn’t blow your mind, simply because they are just a step up from your regular cushion. Just taking Mamonde (RM90) and Sulwhasoo (RM230) by way of comparison, you’d have noticed that the Mamonde cushions this time offer high coverage, but that their texture was heavy, and the shade was off. By comparison, Sulwhasoo offered very good coverage, yet was lightweight on skin and showed off your skin better. I’ll show you the side-by-side before/after from the previous posts. 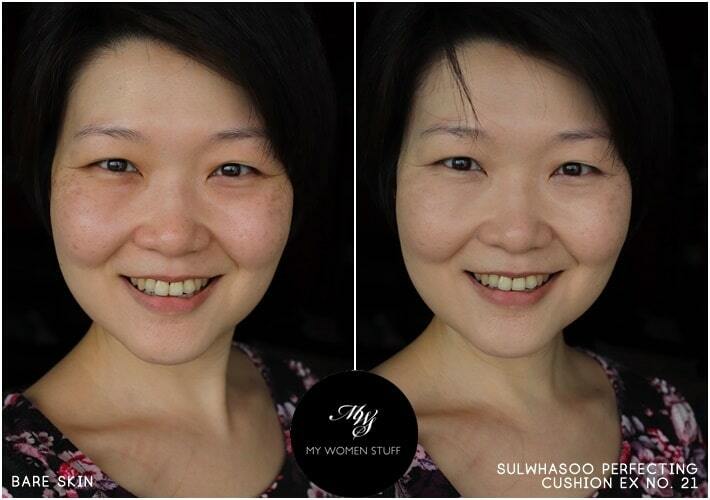 Discounting the slight lighting discrepancies in both photos, I think you will agree that the Sulwhasoo Perfecting Cushion EX looks far more natural on me, looking almost as if I did not have makeup on. 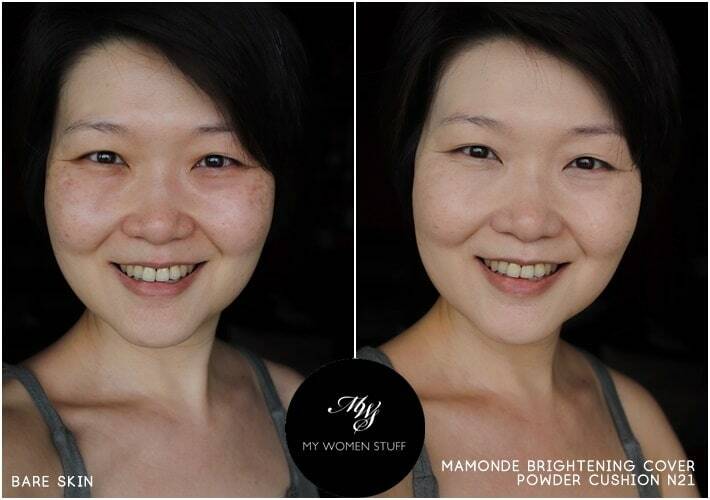 By comparison, the Mamonde Brightening Cover Powder Cushion looks almost like a mask. I was careful to not overdo the application, so I apply as much as is comfortable for me – a thin layer. Yet, the difference is quite stark. I’ll include the Shiseido Synchro Skin Glow Cushion Compact here for comparison as well. Similarly, despite the higher coverage, it is still transparent enough to allow my skin to look like my skin. Not like it is covered with makeup. That said, Shiseido makes some of the best foundations in the market (I swear by Japanese brands for base makeup) so I’m really not surprised by this. It is for this reason that I say you get what you pay for. Coverage is easy to achieve – brands just need to increase the amount of pigment colour. But to balance out a good coverage with a good TEXTURE and FORMULA is where I find the higher end brands making a little more effort. While some brands have tried to be innovative with their version of the cushion foundation, for the most part, we are still seeing the same construction – a refill that contains a saturated sponge, a cover to keep the sponge from drying out, and a sponge applicator. I doubt this will change because it is the most logical type of packaging. It is this packaging also that makes it perfect for travel and for touch-ups. Most, if not all cases I’ve come across come with a large serviceable mirror in the cover, that is perfect for touching up on the go. The down-side to a cushion compact is always that it will dry out quite quickly. This is purely due to the exposure to the air each time you open your compact. You can prolong the life of your cushion by using a pair of tweezers and flipping the cushion over in the case. I came across some complaints online by users of the Clarins Everlasting Cushion Compact that said their cushion had dried out after a few weeks. That told me that they were not familiar with using cushion foundations. If you use it enough, you will know that although the surface feels dry, there is still a lot of product contained within the sponge. You just have to depress it a little harder. When it seems like there’s no foundation left to pick up, flip the sponge over and you will be surprised at how much there is left. One other observation I made was the reduction of refill-sharing between brands. When I compared some Korean cushion foundations, I noticed that the ones under the same mother company would be able to share their refills across cases. So, you could buy an affordable cushion like Mamonde, and then buy just the refill from Sulwhasoo to fit. But that’s changing, and I think it’s changing in response to this cleverness of the consumer. Sulwhasoo, in upgrading their formula, has changed their refill as well so it is no longer compatible with its old cases, and similarly with cases from other brands. I tried to test if the Clarins refill would fit into Mamonde cases, as they looked similar visually, but they didn’t. There was just one tiny little millimetre off at the hinge, but that was enough. I think we will be seeing more of this “upgrading” going on. I was quite surprised that the only brand that came with an extra refill pack in this week’s round up was Sulwhasoo. Granted, it has always been a Korean brand thing. I believe it is to give the same perceived value of product, for each refill contains 15ml of product, so 2 refills will give you 30ml, the equivalent of a bottle of liquid foundation. However, I was not too surprised that most brands are taking the liberty to ignore this perceived value to the consumer. Here’s a little comparison of the price per ml broken down by product. 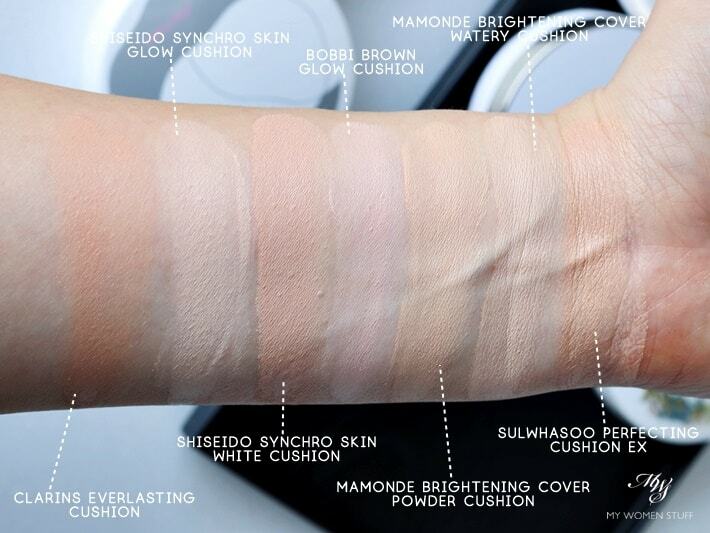 Using volume as a guide therefore, Sulwhasoo, which is the most expensive cushion foundation I featured this week turns out to be the best value product for quality, just a little bit more expensive than Mamonde. Dollar for dollar, pick the Sulwhasoo because it is just better. That said of course, the initial outlay is the most hefty. Shiseido was a bit of a disappointment, as they offer less content in each refill, which makes them the most expensive when broken down. I feel that if they had offered an extra refill, it would have made all the difference. This time around, I had the opportunity to test the cushions from 2 same brands but in 2 different formula. What I found was that the same shade in each brand and formula would differ quite significantly from the other. Here are the swatch comparisons from this week, to show you what I mean. For our purposes, I suggest we discount the Bobbi Brown Radiant Glow Cushion, as that isn’t really a foundation. Just looking at the 2 swatches of the Shiseido foundations are enough to raise brows. They are both in the same shade – Neutral. 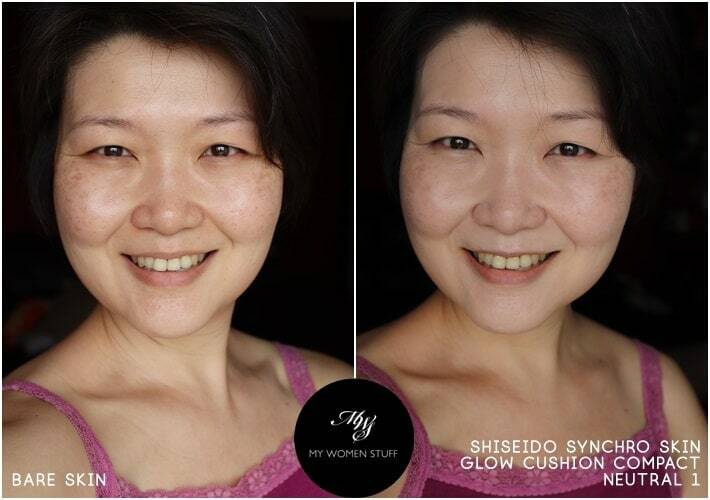 Yet, the Synchro Skin Glow Cushion has a more neutral tone and is lighter, as opposed to the Synchro Skin White Cushion, which has a significant pink tone. Similarly, look at the Mamonde Brightening Cover Powder Cushion, as compared to the Watery Cushion. The Watery Cushion is significantly lighter in tone. Coupled with its opacity, it comes off whiter on my skin. By contrast, the Sulwhasoo Perfecting Cushion EX has a more peachy tone, and in fact, looks even deeper than the Mamonde Powder Cushion. Yet, it fits my skin better. Do note that the Korean brands are all in the shade #21. 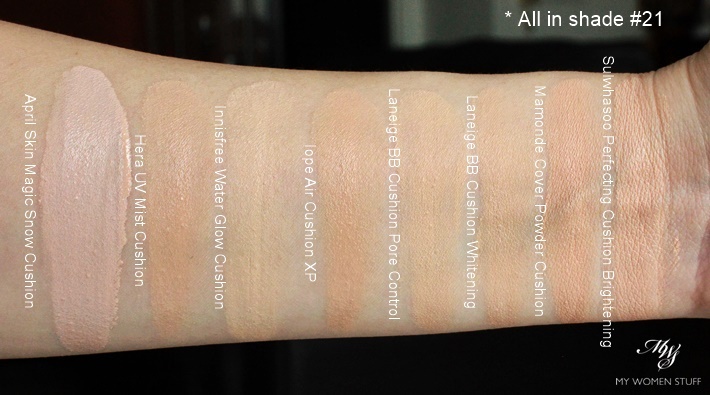 For our recollection, here is the swatch comparison in the last Cushion Foundation Week 2, which featured all Korean brands in Shade #21. The shade disparity is quite great even here. In terms of shade, barring Sulwhasoo, which has now expanded its shade selection to 10 shades, encompassing a few deeper tones, those with a deeper skin tone will still encounter difficulties buying a cushion foundation. For the most part, the shade selection will be quite poor, and it will come off on your skin ashy. I will however, also caution that picking a cushion with a pink tone isn’t always ideal. If you use a pink toned foundation on warm skin tones, it comes off ashy grey. I raise this, as many Korean or Asian brands will have pink tones in their base, to counteract the sallowness of many Asian/Oriental skin tones. This innovation is still very much Asian-brand dominated, and is still targeted at the Asian market, so bear this in mind when shopping online for brands that you have no access to. Are you still using cushion foundations? I recently picked up my YSL again because I’m not working so i really jsut need a bit of coverage. The thing with YSL is how build able it is. I can go for a barely there look or I can go full face medium coverage. It gives me the dewy look which I adore. Like we discussed the other day, this is on its last legs. I’ve flipped the cushion multiple times and I’m close to tossing it. If I can wait, I’ll get the sulwhasoo when I fly over but I think I may pick up the shiseido here. Really? I thought innisfree sells it, but turns out only case. I’ll check out aliexpress. Thanks! That’s a really great idea! I must check these out too coz I have a similar problem. Thanks for the review… just in time for me as I am running out of cushion soon. Will be happy to pick up the Sulwhasoo again and try out the Shiseido one. It’s an interesting point that you have made – that high coverage need not feel or appear heavy. I find both Shiseido and Sulwhasoo to be really natural and dewy on you and that’s what I would like in a cushion or BB cream. If I want something heavier, I will go for foundation. So if a cushion becomes too heavy, that would make me a very confused user. Blogging daily is killer! Hats off to everyone who still does it LOL! And I do appreciate that the high coverage cushions feel super light on skin! I also thoroughly enjoyed travelling with them, because it gave me the coverage and glow without feeling heavy and cakey. I can see the merits of using a cushion foundation, but I’m still very picky about the ones I do use LOL! Still using. Just bought a sulwhasoo at changi lol. Always keep one in the office and the car for touch ups. Cant beat the convenience! Now there are loads of options! 😀 I can vouch for ease of use during travel. It was all I had with me! I’ve tried my first cushion, the Maybelline Dream Cushion and actually now I understand why people seems to love them so much, they’re so easy to use that it’s what I always carry when I haven’t put on makeup and I’m on the go. It’s good enough that I want to repurchase, but I don’t like the fact that there’s no refill option and the finish is too luminous for my taste, it looks really natural at the beginning, but gets oily faster than a matte finish. I was thinking that the cushion can’t have a really matte finish because the foundation would dry faster that with a satin one. Nail on the head Efrain! Cushions make it so easy to use and are so portable! I took one with me on holiday too! The Korean brands do often come with a refill but most western brands don’t. Some of the Korean brands do have a more matte finish, but in general, yes, they have a more satin finish which I think is to do with the formula. You can’t have a heavy formula in a cushion or it’d dry out in no time!